Finding your wings is hard-enough for a young sparrow like Richard; especially when you’ve been brought up thinking you’re a stork! But Richard is a plucky chick who won’t be defined by others’ expectations of him. A STORK’S JOURNEY is the exciting family adventure of heroic little birds who aim high and dream big, available exclusively at Vue nationwide from 31st August, 2018 courtesy of Signature Entertainment. Richard, an orphaned sparrow, has been raised by a loving family of storks for as long as he can remember. He would never even dream of himself as anything else but a stork. However, when his adoptive family start preparing for their epic migration to the warmer climes of Africa, they have to level with him: A little sparrow isn't made for such a long journey. Left behind by a flock of heavy hearts, Richard perseveres. Initially setting off to Africa on his own to prove he is a stork after all, Richard meets a vast array of quirky and determined friends, who help him come-of-age and realise it’s the size of your heart that counts. Join Richard on his journey to Africa, as he learns the importance of friendship and the value of having faith in your own abilities. 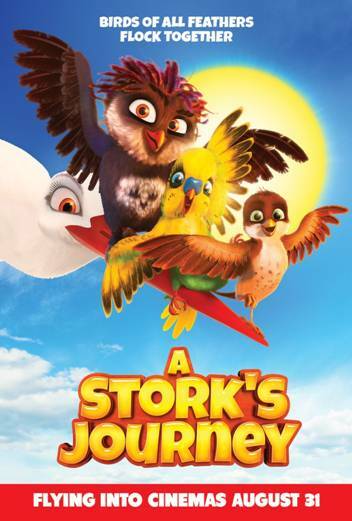 A STORK’S JOURNEY is an uplifting story of courage and exceptional friendship guaranteed to give families visiting Vue cinemas a warm start to the Autumn!